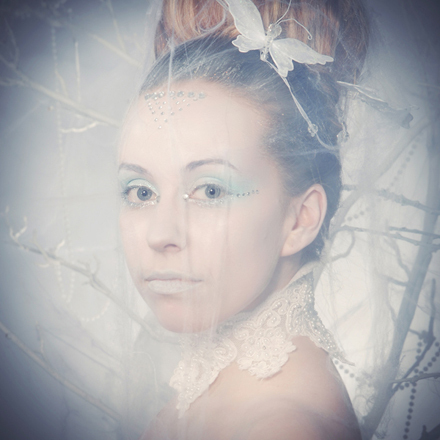 The intention with the Enchanted shoot was to depict a very soft, ethereal, fantasy forest style scene, portraying a beautiful, fair skinned, delicate young woman......very distant with an air of iciness. To achieve this more set building was needed...... this involved making a small forest from very large branches, the branches once painted were positioned and adorned with numerous ice like strands of beads and jewels then draped with artificial cobwebs to create the surreal landscape. Marta the makeup artist interpreted the icy futuristic look really well which complimented the great hair from session stylist Tony Arts. A smoke machine was used to create the misty, dreamlike atmosphere, which was controlled with great deftness by David Weir.....he will thank me for saying that, as at times we couldn’t see a thing...... but it did create the desired effect in the end. Finally for some of the head shots Claire was covered in cobwebs which hung right over her face....however to her credit she posed beautifully but did have a slight ‘Miss Havishem’ look!